Fred is almost nothing more than a low level swirl of clouds now, except for some deep convection on banding well north of the center. A satellite estimate came in at 41 knots a few hours ago. With no convection near the center and the wekaening trend, we will now estimate 35 mph or just below tropical storm force. At 8 am edt / ast Hurricane Fred was centered at 17.5° N / 33.5° W or about 695 miles west northwest Sal, Cape Verde Islands. Top sustained winds are estimated at 35 mph (NHC 45 mph). Fred is drifting barely north. Note our position estimate is different from the hurricane center's because we are using different reference points. Fred should start moving west northwest as a very weak low in the next day or two. 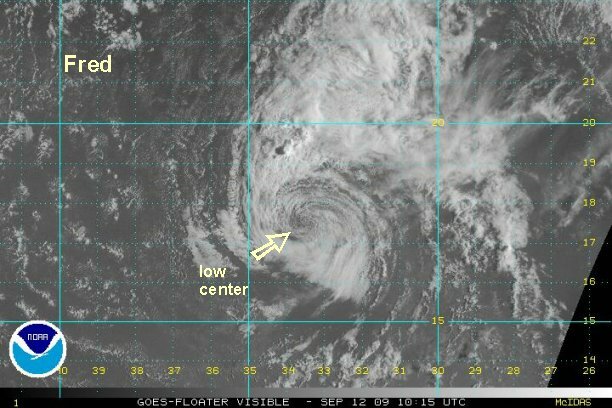 The National Hurricane Center has finally downgraded to tropical depression of 35 mph. This will be the last advisory on Fred unless regeneration occurs. Fred has been trying to make a comeback over the past 24-36 hours. There have been brief small convective bursts around the circulation. Several hours ago, a rather impressive burst. If this burst was sustained we would have said that Fred is back again and should regain it's tropical depression status. Forecast models try to reenergize Fred a little and move it west northwest in the general direction well north of the Leewards over the next couple of days. As of Midday Wednesday, Fred's circulation is still firing up thundershowers on the north side. Visible satellite imagery shows that the low level circulation is still intact, but weak. It appears that the remnants of Fred will increase chances of rain to the northern half of the Bahamas over the weekend. Right now the circulation with Fred is centered a few hundred miles east of the central Bahamas moving west northwest. The latest Quickscat satellite estimates show that the remnants of Fred still do not have a closed low at the surface. Some showers and storms are associated with this system and are likely to affect the northern Bahamas and Florida into the weekend / early next week. Rainfall will be enhanced as this feature moves through. The circulation with Fred is still depicted as a strong tropical wave on Quickscat satellite. A new burst of heavy showers and storms are associated with it. There is still some chance of minimal development as it increases rain chances from the northern Bahamas / Florida north to the Carolinas over the next few days.